French musician VedeTT finds beauty in the cerebral. The Angers-based artist sings of social dynamics through the gauze of hazy synths and atmospheric vocals. Pulling inspiration from artists as varied as Radiohead and The Strokes, the singer creates songs that are equally meditative and dance worthy. This week VedeTT lands in Austin as a featured Angers Week musician where he’ll be playing all over town including Blackheart Bar, Barracuda, Butterfly Bar and more. Sound Dessert spoke to VedeTT about the irony behind his name, French style pizza, and what he’s most looking forward to while visiting Austin, TX. 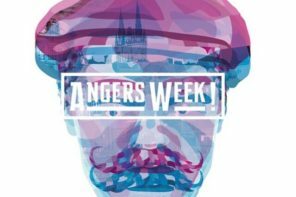 See where VedeTT is playing in Austin for Angers Week here. Sound Dessert: Where does the name “VedeTT” come from? VedeTT: It comes from a Belgium beer. One day I was drinking this beer, and I liked the name. In France, a VedeTT is like a “star” but the term is pejorative. It’s an ironic take. SD: How do you feel the Angers and Austin alliance benefits both each city? VedeTT: I think the twinning of the cities is beneficial because it allows those who wish to, to open up to other cultures. Austin and Angers are two very musical cities, and the quality of life is said to be quite similar, but in two very different societies. It is interesting to discover and compare the differences. Beyond that, it’s cool to be able to travel with this program! SD: What are you most looking forward to during your time in Austin? VedeTT: Finding out how people live, places, food. In Europe, we grew up with American film and TV, so we’re curious to see if it is similar to what we imagine. In terms of music, we see many American groups in France, so we know what to expect, but I think it will be even cooler to see them on their homeland! SD: Where inspires some of your music? SD: Who are some artists you admire? VedeTT: I like many artists for very different things. I love Radiohead’s career and personality. They are very simple, very humble and very creative. And their music is a class act! I also love The Strokes, for exactly the opposite. There’s is a completely different approach to music. In both cases they are artists that fascinate me! SD: What’s unique about being a musician in Angers? VedeTT: In Angers, and more generally in France, we’re very fortunate. Many resources are available to us, no matter what style of music. There is a real support for all projects, and we have technical, financial, material support and even counseling. Not to mention the infrastructure of shows that give professional musicians a relatively fixed salary every month, even for amateur musicians! SD: Best food in Angers? VedeTT: There are many good things to eat in Angers. France is famous for its cuisine and each region has a specialty. SD: Do you pursue any other interests or passions? VedeTT: Unfortunately I do not have time to have another passion outside of music. I love going to the cinema and out to restaurants, and spending time with my girlfriend and my friends. SD: Name a few highlights from this past year. VedeTT: The death of David Bowie, Lemmy, and my Grandfather. The new Radiohead LP. SD: What’s your favorite dessert? VedeTT: I love apple crumble!! Listen to VedeTT’s album Tuer Le Gens here. See him live in Austin here.